This year’s Drive Electric Week event , entitled “Driving Change” was the largest yet in terms of the number of EVs on display, number of vehicles available for test drive and number of test drives given! The three- hour event was scheduled to end at 2pm, but because of overwhelming demand, the OEM’s stayed an additional hour. Most of the OEM’s had a wait time of 30 minutes to 1 hour the entire event. Many EV owners supported the event by bringing vehicles and speaking with event attendees. The event also featured showcase opportunities for EV charging and solar providers. 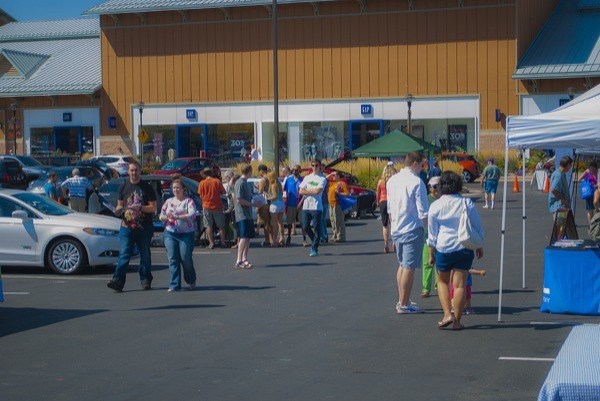 The location at Aspen Grove Shopping Center generated lots of foot traffic and we were able to work with many of the Center’s merchants to establish a cross-promotion that benefited the retailers and restaurants as well as our event. Come experience a variety of electric vehicles from Ford, Chevrolet, Nissan and Tesla at this one-of-a-kind event! Go for a test drive, get your questions answered by an expert and meet with current EV owners who can tell you more about the experience of owning an EV and why it is that they love their cars so much! There are currently 157 attendees registered. Registered attendees report 327,973 electric miles driven.